Graphic Presentation by Willard Cope Brinton is an early visual bible that explains everything from graphs and charts to choosing paper and proofreaders’ marks. One of the best infographics in the 526-page tome succinctly explains color visibility and, in effect, why some signs and logos work better than others from a chromatic perspective. Brinton charts 14 degrees of visibility all the way from black type on a yellow background (the most legible) to blue type on red (the most offensive). This research is certainly nothing new today, but gets you thinking about how the theories have been exercised. 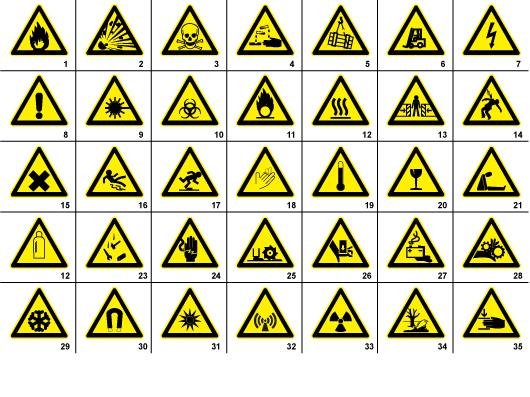 Take, for example, the classic hazard symbols, or street signs—they each use the most visible color combinations per Brinton’s chart. He also compares how the combinations look to colorblind individuals (it should be noted that there are varying degrees of color blindness). The red type on a green background and vice versa become completely illegible. Still, not shabby work for 1939! Archive.org has the full book available for reading online.